Homes, apartments, duplexes, mobile homes and efficiency units for rent in the Havelock and Cherry Point area that are affordable for any budget available in short term and long term leases. 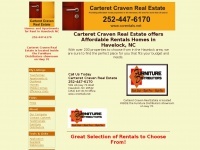 The web server used by Ccrentals.net is located in Oakland, USA and is run by iHOUSEWEB. On this web server 69 other websites are hosted. The language of those websites is mostly english.